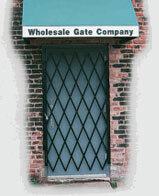 Folding Door gates are designed to provide security for door openings 24" to 48" wide. Heights range from 61" to 83." These gates have a reversible hinge design to allow mounting on the left or the right side. They can be mounted in the casing or on the facing of the door opening. All Door Gates include a locking bar. Our Folding Gates will pivot 180 degrees out of the way when open. Our Door Gates are made of a sturdy 3/4" channel and are painted black enamel. *Single units are able to ship via a ground carrier (UPS, FedEx, etc.). Multiple units may require shipment via an LTL carrier. See shipping terms for details.